Welcome Everyone! 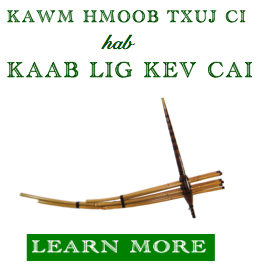 This website’s main purpose is to provide you with great resources to learning the Hmong language. Here, you would be able to Read, Write, Listen, and Speak Hmong within the courses that are offer. As a student and a native Hmong speaker, I know that there are not many resources offer to on the language. I have been teaching Hmong for a few years now, and I know the best and most effective ways to learning the language. Learning Hmong can be hard and easy at the same time. What makes the language hard is because Hmong is a tonal language with eight different tones. For foreigners who are not familiar with any of the Asian language, it could be very hard and takes a lot of time to master. But anyone who has exposure with any of the Asian language, learning Hmong is not that hard considering that the Writing System is very easy. As for native Hmong, learning the writing system is a piece of cake if you speak the language well. You can learn the writing system in a month and be able to read and write any word if you just spend about one hour a day learning. The Speak Hmong course is designed for anyone who wish to learn Hmong that does not have any exposure or experience with the Hmong language before. The course only focus on speaking Hmong and it is divided into three parts; Speak Hmong 101, Speak Hmong 102, and Speak Hmong 103. In Speak Hmong 101, students will study 30 lessons with different topics that focus on simple words and phrases. In Speak Hmong 102, students will study another 30 lessons with a few similar topics along with new topics in Hmong. This part will introduces more complex words and phrases. Lastly, in Speak Hmong 1o3, students will learn 30 more lessons that will continue on with complex words and phrases. This part will mainly be small dialogues between two people. This course is now OPEN for registration! The Hmong Vocabulary Course is designed for anyone who has very little knowledge and exposure to the Hmong language and would like to expand on his or her vocabularies. The course is divided into 5 parts that contain 30 lessons of related words within each lesson. The first 20 lessons within part 1, 2, and 3 will contain pictures and translations with each vocabulary. The rest will not have picture beside a translation. This course will focus on the Romanized Popular Alphabet (RPA) Hmong Writing System and it will provide a solid foundation of the structure and the usage of Hmong writing system. After taking this course, students will be able to read, write, and pronounce every letter, vowels, consonants, and words in the writing system. Students will also be able to understand the usage of vocabularies and the content from the transcript that comes along with the course when they sign up. The course will be taught in this order lesson by lesson; tone marker (Tsiaj Ntawv Cim), Vowels (Tsiaj Ntawv Niam), and Consonants (Tsiaj Ntawv Txiv). As students learn each vowels and consonants, there will new vocabularies and text content in each new lesson. 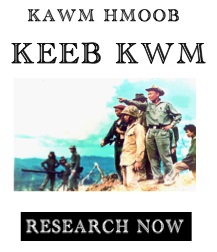 1) As of now, the Reading Writing Course is only offer in White Hmong dialects. When I finish with the White Hmong dialect, I will start to develop the Green Hmong dialects course. 2) This course is mainly for Hmong native speaker with little or no exposure to the RPA writing system. But I highly recommend the course for any non Hmong who want to learn how to read and write the Hmong language as well. That’s because every word and sentence will be translate into English in full PDF transcript of each lessons when students sign up. The Conversation Course is divided into three different level; Beginner, Intermediate, and Advanced. The course is based on a storyline with a diverse cast of characters who are currently college students. As they live their normal lives going to school and communicating with each others, they will take the you (students taking this course) on a journey through a typical Hmong world in the United States. You will learn the Hmong language and its culture through every conversations by cast of characters as they learn from each other and become good friends. In the beginning level, you will learn mainly basic everyday usage of the Hmong language. In the intermediate level, you will explore more in dept into the language with much more vocabularies and complex phrases. From the middle toward the end of the intermediate level, the cast of characters will be having conversations leading to and exploring the Hmong culture, traditions, and religions. In the advanced level, the entire course will be basic on and exploring in dept on the Hmong culture, traditions, religions, and history. Topics in this level will consist of the Hmong most important ceremonies which are the Birth Ceremony, Wedding Ceremony, Funeral Ceremony, and New Year Festival. PDF transcripts of every lesson, worksheets, and glossary will be provided when students sign up for the monthly of six months course. 1) As of now, the conversation course is only offer in White Hmong dialects. If there are demand for a Green Hmong Conversation course, I will be gladly to develop one. 2) This course is mainly for non Hmong with little or no exposure to the language who wish to learn the language. But I highly recommend the course for any Hmong who does not speak the language well and/or want to learn how to read and write the language. Full PDF transcript of each lessons will be provide when you sign up. This course has been POSTPONED and will be offering at a later time. In this course students will learn a wide varies of different themes, subjects and topics. Each lesson is different and will be present differently depending on the subject of topic. Here are some of the subjects or topic just to give students an idea of what the lessons will contain. Topics in Hmong Culture, Traditions, and Religion. Transcription and discussion of Hmong Traditional songs and stories. Transcription and discussion of Hmong Modern songs and life/moral lessons. Discussions of Hmong everyday lives and current news in the US and around the world. This course is design for native Hmong speaker or anyone who can speak, read, and write at the high intermediate level. The course will be in White Hmong, Green Hmong, and/or both dialects that varies from lesson to lesson. It will contain 90 percents in Hmong and 10 percent in English. The course will also have transcripts with the texts or contents that are being discussed in the lesson. This course will NOT being offering until further notice. The course contain Hmong Traditional Folk (Lug Txaj), Wedding (Zaaj Tshoob), and Funeral songs that include Txiv Xaiv, Qeej, Paaj Qeeg, and Nkauj. There are two parts to this course and you must sign up separately in order to have access to all of the songs. The first part contain Zaaj Tshoob and Txiv Xaiv, while the second part contain Qeej, Paaj Qeeg, Nkauj, and Lug Txaj. 1) VERY IMPORTANT NOTE: The course only contain the traditional songs and how it is use during a Hmong Wedding or Funeral. It DOES not contain the procedures and processes of a Hmong Wedding or Funeral. 2) All traditional songs will only be in Green Hmong Moos pheeb. If I do have any resources in White Hmong in the future, I will make a course on it as well. 3) The Traditional Songs Course will not be starting until future notice because I am in the process of recording and transferring them into mp3 files. All or most of the songs will be sing or play by me or my masters which I have permission to put it on this website. This course will be offering in the future.